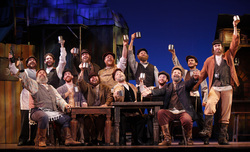 A Yiddish word "L'Chaim" used mainly during toasts at Jewish celebration. Jewish expression “L’Chaim a Glelzele” means “Lets raise a glass of wine and drink to life”. The root of the word "L'Chaim" is "Chai", that in Hebrew means for "life". This word was first mentioned around the 5th century BC. As we know that Hebrew letters can be represented by numbers. The sum of the word "Chai" is number 18. Thus 18 by Jewish people considered a lucky number. Usually gift or contribution to charity given in multiple of 18. The Performer of this song is Misha Alexendrovich. He was very popular singer in Russia. He was born in 1914 in the shtetle of Berspils in Latvia. Even Stalin and Krushchev would call him for private concerts. Later he immigrated to Israel where he became a chief cantor in Ramat Gan Synagogue..
ven me zitst bay a yontevdikn tish. me zol shtendik nor munter zayn un frish. un far yedern bazunder vos zaynen haynt mit undz nito. nor oyf simkhes bay yedern fun aykh. keyn shvartser tog in lebn in der mishpokhe zol nit zayn. ven me zet zikh mit fraynd oyf dos nay. Mit layblichn un munter, ir zolt keynmol ni tsesheyd. Un far sholem oyf gor der gantser velt.